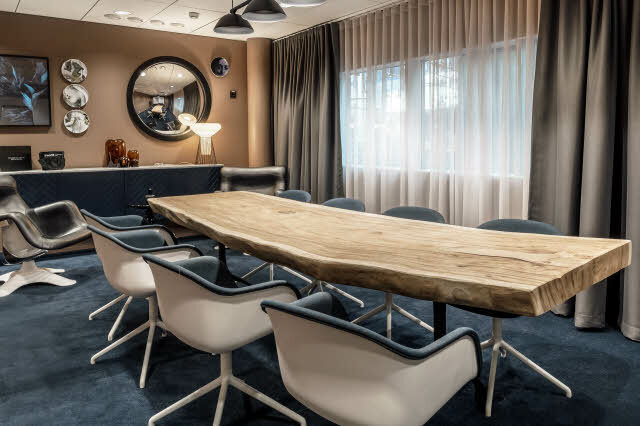 An inspiring hotel that caters to your every need, located at the Helsinki Airport next to Terminal 2 and can be reached through a covered walkway. The perfect place to stay and meet. The hotel is a great place to catch your breath in the middle of the buzzing Helsinki Airport. In the airy and spacious atrium lobby you can enjoy delicacies from the restaurant, and the bar serves refreshing drinks and snacks around the clock. The stylish and modern rooms and extensive room selection cater for all needs. The rooms have high-quality beds and all that you need for a good night’s sleep. In addition, some of our rooms have a bathtub and there are rooms with bunk beds for a larger party. There are many different spaces for work and meetings. Meet for a business lunch or raise a toast before taking off in the atrium lobby or restaurant. Our meeting rooms are perfect for organising an efficient meeting. The gym and sauna can be found conveniently under the same roof. It is easy to arrive and leave the hotel, as it is located just 200 m walking distance from Helsinki Airport Terminal 2 and the train station. Connections to the centre of Helsinki are quick and easy. The train journey takes approximately half an hour and a taxi ride is approximately 20-30 minutes. In the nearby shopping centre Jumbo you can find various shopping opportunities, a cinema and a spa. With us you don't need to worry about parking. The varied parking options at the airport are located right next to the hotel, the closest being parking area P5. There are 9 flexible and modern meeting rooms in the hotel for up to 36 people, as well as a spacious atrium lobby for comfortable breaks.